A video-game exclusive is like a jug of milk at the supermarket – it has a limited lifespan at best. And that stinks for some platforms that really hope to hang on to these blockbuster titles just a little bit longer to drive sales of the primary unit. But what are you going to do? After all, console exclusives have largely gone the way of the dinosaur. The recent announcement of Oculus Rift smash-hit Skyworld making its way over to PSVR just confirms this. Although it was on HTC Vive as well, PSVR is largely seen as the Rift’s main competition. Of course, that’s great news for owners of the PlayStation VR but must stink for Oculus which is increasingly facing tough competition from other platforms. This is because the PSVR has shown no signs of slowing down and continues to attract new developers almost daily. Couple that with Sony’s door-busting discounts on PSVR bundles this winter shopping season and you have a tremendous foe to take on if you’re Oculus Rift. All of this even comes on the heels of reports of a slowdown in the VR segment and general worries about its future. Sony has not only re-established itself as a leading force in VR but has doubled down on its commitment on into the next generation. People are already starting to talk about the next version of PSVR but they really should start focusing on the here and now because there are some amazing games around the corner. If you haven’t heard of Skyworld, you will soon. 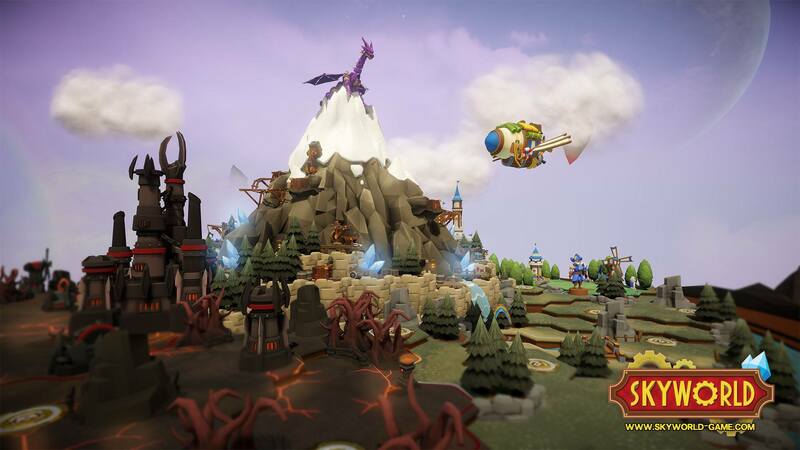 It’s a tabletop strategy game in VR where you place towers and dispatch troops to defeat your opponent. The game partially simulates being in the world and playing as a board game player for a unique combination and gameplay style all its own. Tabletop games, for their part, are experiencing a bit of a renaissance of late so it isn’t odd to see that make its way to video games in some form. And, really, what medium is better suited for that than VR? A lot of Skyworld’s appeal is in this unique combination of board game and video game. While the presentation is necessarily unique because of the VR format, the way the team integrates virtual reality into basic functions for such a seamless experience really speaks to the rewards devs can reap from innovation. A huge part of Skyworld’s appeal is its online component. Online, multiplayer gaming is such a huge necessity in video games these days and its inclusion in Skyworld is similarly expected but very well executed. It is not an afterthought like it is in so many games and part of the reason that Skyworld’s fanbase is so devoted. There isn’t any firm release date on Skyworld as of yet but a lot of people are pointing to an early 2019 release as being the most likely possibility. Of course, we’ll bring you updates as soon as it drops.